Dude, where's my job? Wondering if your job could get outsourced globally? 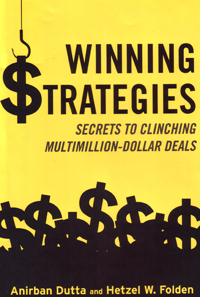 There is a new book out this month called Winning Strategies, Secrets to Clinching Multi Million-Dollar Deals. It is written by Anirban Dutta and Hetzel Folden, global sourcing professionals whose big deals made headline news over the last decade, including companies like SanDisk, Raytheon, Motorola, Citigroup, British Telecom, and Qantas Airlines. Winning Strategies is a guide book on the best practices to send domestic jobs overseas, but it is a significant read for more than just how to off-shore jobs. What is most compelling is the novel approach that India Inc., and other global sourcing companies (including IBM, HP, CSC, Accenture, and Satyam) take to align goals with U.S. major corporations to close deals. It is common today for these global sourcing providers to pay the customer $10MM cash upfront, then write in a 65% operational savings contract guarantee, including incentives and financial penalties based on the customer hitting the bottom line target. The multi million-dollar contracts are for five to ten year periods. Couple these deals with a highly populated, technically trained workforce, who is hungry and working for less then one-tenth of his American counterpart. Top it off with the financial wizards at the multi-national corporation that route business transactions through different international subsidiaries depending on which country has the most favorable tax rate. And you have the new world of business process outsourcing. The outsourcing customers are the industry leaders, the multi-nationals, who show the way. To compete, what do you think smaller companies will do? They will manufacture in China, Vietnam, Sales and Support will be in the Philippines, Tech Support and Operations will be in India, Logistics will be out of Mexico, and Finance will have a war room in Switzerland. "Goodbye America, goodbye Middle Class," a toast from the Chief Executive hiding in his home office. Winning Strategies is a how-to guide to finding, structuring, closing and managing complex international multi-process outsourcing deals. Messieurs Dutta and Folden are the global sourcing deal maker's equivalent of a NFL's Super Bowl Quarterback MVP. 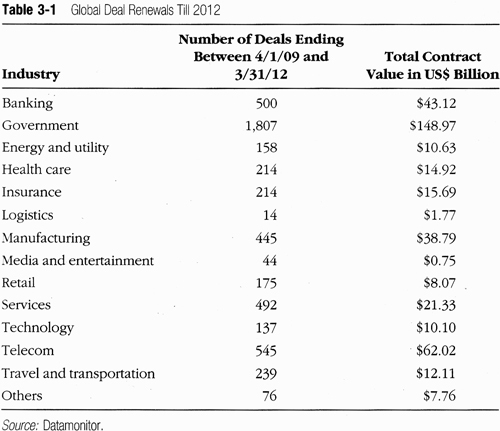 They are part of an elite Big Deals Group, who put deals together for our largest US companies. For the small and mid-size companies with a national product or brand (outsourcing customers), keep in mind what I tell you in every issue. The choice of supply chain partners, which you are one link, is a fundamental part of your business plan and highest efficient execution is critical. That is why supply chain tools that offer real-time actionable intelligence and visibility into the supply chain are a business requirement. That is why the winning distributors and retailers, who are thriving in the current economic downturn, are the ones who make data transparent for supply chain partners. See previous article here. One of the topics that Anirban devotes an entire chapter is working with third party advisors. Third party advisors (TPA) are often industry veterans that can align technology with business drivers. They are used extensively in the big deal process. 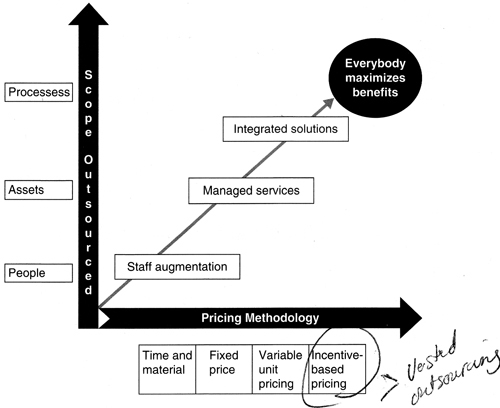 They are brought in and paid for by the outsourcing customers as a friendly guide to manage the evaluation, contract process and sometimes governance of the deal. Anirban mentioned his personal preference of working with TPAs. He even recommends them into his existing accounts. When working with a TPA in new deals Anirban discovered that the deal almost always closed. Also, the more detailed the TPA is in their structure generally means a better deal for all parties. Winning Strategies goes into detail of the life cycle of the deal, as well as instruction on putting together a winning team, working with third party advisors, and how to structure agreements. It is a must read for any outsource service provider or company looking to use or who are already using an outsourced service provider. You need to know how the game is played, to play the game. For the folks who lose their jobs to an off-shore employee, you must evolve with change. It is a global economy and you will have to find your position in it. What happened to the Okies in John Steinbeck's The Grapes of Wrath? They moved, starved or learned to drive a John Deere tractor. I can go on about how Americans and the U.S. are set up to fail but that is a topic for another article. "Who can we shoot?" (Chapter 5). You can find Winning Strategies on Amazon here.